One of the six bracelets in the new Couture Collection from Lisa Hoffman. 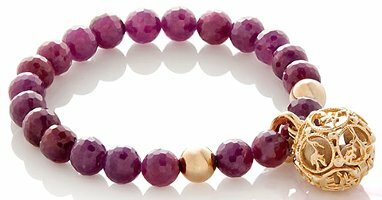 This one features rubies and 14k gold and is $2495; all of the bracelets include fragrance bead refills in six of the brand's scents — you can "layer" your fragrance or use one scent at a time. I coveted the blue leather scent wallet she first came out with – her Japanese Agarwood is really gorgeous – but now she seems to have moved into scent jewelry. Good heavens, this bracelet looks cheap! For $2500 I’d want fancy schmancy. Not that I need to worry about it, of course. …that seems to be over. She has a real variety of jewelry over there, in a huge range of prices. Dustin Hoffman’s wife huh? So, that’s why the high prices? I guess it’s real rubies but they don’t look like it, perhaps it looks better in person. Whoa! Really great idea and very, very pretty but not such a pretty price tag OUCH! But, I want one! Yeah right, and I want world peace too! The “costume jewelry” ones are much cheaper! I can spray some fume on some cheap costume jewelry and be good with it for that price. It does look like cheap jewelry though, if I bought it and said the price, I would doubt people would believe me. Looks like something from Kohl’s clearance rack. Agreed. Better things to spend several thousand dollars on, even if it doesn’t look fake in person.